Tagaytay, officially the City of Tagaytay, (Tagalog: Lungsod ng Tagaytay), or simply known as Tagaytay City, is a 2nd class city in the province of Cavite, Philippines. According to the 2015 census, it has a population of 71,181 people. It is one of the country's most popular tourist destinations because of its scenery and cooler climate provided by its high altitude. 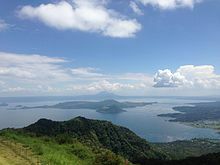 Tagaytay overlooks Taal Lake in Batangas and provides views of Taal Volcano Island in the middle of the lake through various vantage points situated in the city. Legend has it that the word Tagaytay came from "taga" meaning to cut and "itay" which means father. A father and son were said to be on a wild boar hunt when the animal they were chasing turned and attacked them. As the boar charged towards the old man, the son cried "taga itay!". The boy's repeated shout reverberated in the alleys of the ridge. Heard by the residents, hunters and wood gatherers, the cries became subject of conversation for several days in the countryside. In time, the place where the shouts came from became known as Tagaytay. The most feasible origin is that city is named after the Tagalog word "tagaytay" which means ridge. On February 23, 1945, the 11th Airborne Division of Lt. Gen. Robert L. Eichelberger's 8th Army performed a combat jump of the 511th Parachute Infantry Regiment and associated elements on the ridge, with a drop zone around the Manila Hotel Annex, which had been cleared of Japanese forces by Filipino soldiers of the 4th, 42nd, 43rd, 45th and 46th Infantry Division of the Philippine Commonwealth Army, 4th Constabulary Regiment of the Philippine Constabulary and recognized guerillas. To commemorate this event, a marker was installed in 1951 at the junction of Silang, Canlubang-Nasugbu roads by the city officials in coordination with the National Historical Institute of the Philippines. The southern and eastern portions of Tagaytay are covered by hills and mountains which is generally forests, pine trees and open grasslands. The city lies along Tagaytay Ridge, a ridge stretching about 32 kilometres (20 mi) from Mount Batulao in the west to Mount Sungay in the east with elevations averaging about 610 metres (2,000 ft) above sea level. Mount Sungay, in Tagaytay, is the highest point of the province of Cavite at 709 metres (2,326 ft). Pineapple field in Tagaytay with a papaya tree and banana plants in the foreground. Despite rapid urbanization of Tagaytay, agriculture remains an important part of the city's economy and development. As of 2009, it is recorded that there is about 1,292 hectares (3,190 acres) of agriculture land which is about 20 percent of the city's total land area. The city was once a cogon land after it was discovered during the Taal eruption. The soil was proven to be with rich volcanic components suitable to farming with main agricultural goods produced are pineapple, coffee, banana, root crops, cacao, camote, cassava other fruits and vegetables, and cut flowers which are supplied to both local and international markets. Garden plant shops thrive the Tagaytay Calamba Road. The city was once an abundant Daisy and gladiola farming haven prior to tourism development and residential boom. Tagaytay is considered to be the second Summer capital of the Philippines with the first being Baguio due to its cool climate thus is a favored destination from those relatively more humid areas of the Philippines. Tagaytay is also a destination for tourists seeking views of Taal Volcano and the surrounding lake. In 2015, the Department of Tourism cited Tagaytay as the top tourist destination in the Calabarzon region. Among the most visited sites in Tagaytay are the SM Sky Ranch Amusement Park, Ayala Malls Serin, Robinsons Summit Ridge, Picnic Grove Complex, People's Park in the Sky , Halfway Zoo and different choices of restaurants known for serving the famous Bulalo and crispy Tawilis. Fresh beef and vegetables are at Tagaytay Mahogany Market. The fruits stands are across the Tagaytay City Market where the fresh Tilapia from Taal Lake are marketed. Tagaytay's proximity to Metro Manila is attributed to the tourism in the city. Tagaytay receives seasonal influx of tourists during the Christmas season and the Lenten Break, the city is a religious Mecca of the South where the Our Lady of Lourdes and Our Lady of Perpetual Help parishes are located. The Taal Vista Hotel is a symbol of Tagaytay's past. The South Luzon Expressway serves the city via Tagaytay–Santa Rosa Road that passes Santa Rosa and Silang from Santa Rosa and Eton City-ABI-Greenfield Exits, and Tagaytay-Calamba Road that passes Tagaytay Highlands and Calamba Premiere International Park from Batino Exit. Manila-Cavite Expressway (CAVITEx or formerly, Coastal Road) also serves Tagaytay via the southbound Aguinaldo Highway. 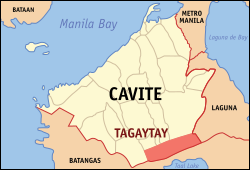 The Cavite–Tagaytay–Batangas Expressway (CTBEx) is a proposed expressway that will connect with the under-construction Cavite-Laguna Expressway (CALAEx) from CAVITEx-Kawit up to SLEx-Mamplasan. CTBEx and CALAEx also connects with an interchange at Aguinaldo Highway in the future for easier travel of tourists coming from Metro Manila. 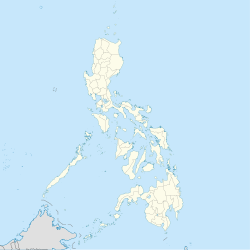 From Batangas, the main route to Tagaytay is either Tagaytay–Nasugbu Highway, a major thoroughfare from Tagaytay rotonda to Lian, Batangas, Ligaya Drive, a winding road that starts near the poblacion of Talisay and ends near the Tagaytay Picnic Grove, or Tagaytay–Talisay Road, a 12-kilometre (7.5 mi) road from Lemery–Agoncillo–Laurel–Talisay Road to Tagaytay Rotunda. From Laguna, the main route is the Tagaytay–Santa Rosa Road from Santa Rosa, Laguna and the another route is Tagaytay–Calamba Road (via Tagaytay Highlands) from Calamba Premiere International Park at Calamba, Laguna. ^ a b c "Tagaytay City Ecological Profile 2013" (PDF). Tagaytay City Official Web site. Tagaytay City Government. pp. 1–2. Archived from the original (PDF) on 2015-11-17. Retrieved 15 November 2015. ^ "History" Archived 2012-08-05 at the Wayback Machine. Official Website of Tagaytay City. Retrieved on 2012-02-04. ^ "Tagaytay City – Geography". Cavite Province Official Website. Retrieved on 2012-02-04. ^ "Mount Sungay" Archived 2015-04-02 at the Wayback Machine. Mountains Mounts. Retrieved on 2012-02-04. ^ "Taal Volcano Flyer". Philippine Institute of Volcanology and Seismology. Retrieved on 2012-02-07. ^ "Climate: Tagaytay – Climate graph, Temperature graph, Climate table". Climate-data.org. Retrieved 25 May 2014. ^ Philippine Standard Geographic Code listing for Tagaytay Archived 2017-09-09 at the Wayback Machine – National Statistical Coordination Board. ^ "Tagaytay City Ecological Profile 2013" (PDF). Tagaytay City Official Website. Tagaytay City Government. pp. 27–28. Archived from the original (PDF) on 2015-11-17. Retrieved 15 November 2015. ^ "Updated City Development Strategy Report for Tagaytay City 9 Mar 2009" (PDF). Cities Alliance. Cities Alliance. 9 March 2009. Retrieved 15 November 2015. ^ Giron, Anthony (3 January 2015). "Tagaytay not far behind with 500,000 tourist arrivals". Manila Bulletin. Retrieved 15 November 2015. ^ Limpin, Rogelio (14 December 2014). "Tagaytay tourist visits to reach 2M". The Manila Times. Retrieved 15 November 2015. ^ a b "Tagaytay, Philippines & Rohnert Park, California". Washington, DC: Sister Cities International. Archived from the original on 2015-02-04. Retrieved 2015-02-04. 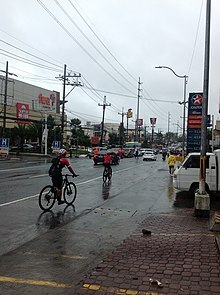 Wikimedia Commons has media related to Tagaytay City. Wikivoyage has a travel guide for Tagaytay.